In previous columns we have talked about what it means to raise and finish a beef and about the art of butchering. Today we’ll discuss an intermediate critical step called aging. The purpose of aging is first to tenderize, second to change (and hopefully improve) flavor, and thirdly to increase juiciness. Aging is a process unique to beef and some wild game because of the maturity of the animal at slaughter. Common young meats like chicken, pork, veal, and lamb do not require aging. There are two aging techniques used today. The first and most common is wet aging, and the second is dry aging. Wet aging is most common because it fits the industrial meat model common in our country now. Large chunks of the carcass are sealed in vacuum-packed bags and allowed to age in refrigeration for 7 to 21 days or more. Because of the packaging, there is little water loss from the raw meat. (Lean beef muscle is 70% water). Thus, when you buy a steak at the store, or at a restaurant based on pre-cooked weight, some of what you buy goes up in steam during cooking. There is no art to wet aging; it is strictly a formula-based process that contributes to the commodity nature of beef that wants every piece of beef to come out exactly the same every time. Now for the real deal: dry aging. Dry aging originated when beeves were slaughtered at the farm during the cool season of the year and allowed to hang in the shed. The outcome of the aging process was variable depending on the current weather conditions, but usually resulted in a more tender meat product. Science and technology have caught up with the practical and dry aging is now a technical art. 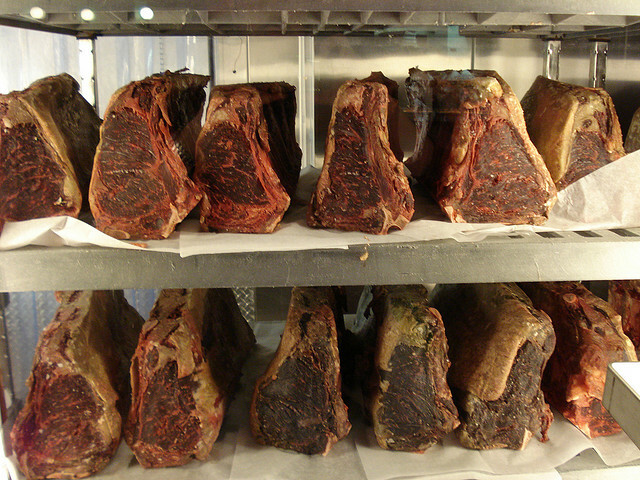 Today, dry-aged beef is hung in a room carefully controlled for temperature, humidity, cleanliness, and air movement. The time of storage varies depending on size of animal, fat cover, and desired outcome—factors that are largely subjective to the butcher. During dry aging, there is significant water loss from the meat, possibly as high as 30%. But most importantly, this is the process that gives dry-aged beef its significant eating superiority—particularly to the beef connoisseur. Time contributes to tenderness, and the enzymatic processes that occur enhance the flavor. Counterintuitively, the drying effect actually increases the beef’s juiciness by stabilizing and concentrating the fats. For those of us who can’t or don’t patronize those kinds of restaurants, the only equivalent source of such great food is your local farmer or rancher coupled with your local small meat processing shop. It is a rare combination, but it’s worth looking for. You will get the full flavor of what beef should be, along with all the benefits of grass-finished beef. There will be a slightly higher price, but because you are buying real protein, the meat will not evaporate in steam as it is cooked. So, back to youth with aging! With dry-aged, grass-finished beef, you get superior beef with all the health benefits to keep you younger longer. Grass-finished beef has higher Vitamin A, E, and beta carotine, higher omega-3, and higher cancer-fighting conjugated linoleic acids (CLA) than commodity beef. Add to this the great flavor of dry aging and you will look and feel younger.